The most wonderful time of the year is also the most challenging to keep your diet on track. Here are five proven strategies to help you eat healthier–no matter how many tempting treats may be offered to you–so you can avoid holiday weight gain. 1. Monitor Yourself: Studies suggest that tracking health behaviors (e.g., food and beverage intake, daily steps) can provide you with extra motivation when you’re faced with lifestyle choices. A recent study published in the American Journal of Preventive Medicine supports the positive impact of self-monitoring tools. The study looked at 51 post-menopausal women with a BMI >25 and found that those who used a FitBit (with its mobile app) significantly increased time spent in moderate to vigorous physical activity, as well as average steps taken daily, compared to those provided a standard pedometer with no online tracking who did not see significant changes in activity (2). 2. Set Limits Around Alcohol: Since the most wonderful time of year may also be the booziest, alcohol may be making you pile on pounds. In fact, an 8-ounce pour of the festive holiday classic, eggnog, can set patients back 350 to 400 calories – and that’s before the meal has even started. According to the Centers for Disease Control and Prevention, about 50 percent of women ages 18 – 44 and more than 60 percent of adult men drink alcohol. And among those drinkers, some 15 percent of women and nearly 25 percent of men report unhealthy binge drinking behaviors (3, 4). When it comes to nutrition, alcoholic beverages are essentially empty calories, and have been shown in several studies to stimulate one’s appetite, while reducing self-control. You should keep to the guidelines of having no more than 1 drink if you’re a women and 2 if you’re a man. (A drink equals 12 ounces of beer, 5 ounces of wine, 1.5 ounces of liquor). 3. Rehab Your Recipes: Make simple substituting in your recipes to make them healthier, like using whole wheat flour for some of the white flour, cutting back on butter and using plant-based oil when possible, and reducing sugar by using Truvia Baking Blend. 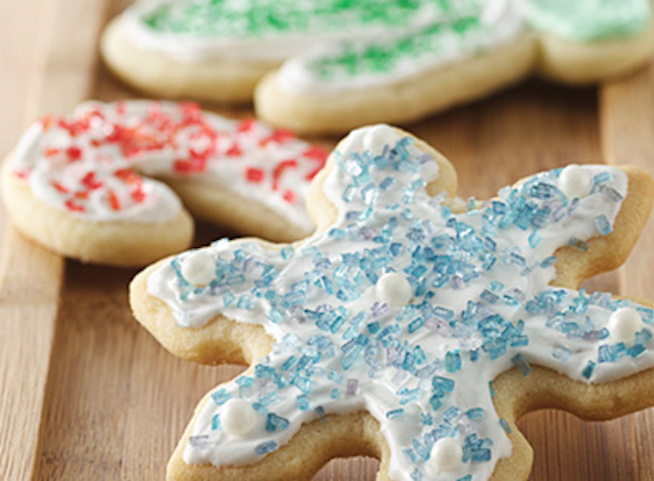 Here’s our favorite lightened up holiday sugar cookie recipe. 4. Encourage Frequent Weigh-Ins: While the media likes to say that individuals often gain 10 pounds during the holiday season, the published scientific literature suggests that the average weight gain is actually just over 1 pound (6). However, the problem with this holiday weight gain is that many people never lose it, and it may account for the majority of the weight an individual gains over the course of a year. Try stepping on the scale at least once a week or even twice. A recent study found that subjects who weighed themselves daily lost about 20 pounds in six months, compared to 7 pounds lost among those who stepped on the scale less frequently. 5. Work on Stress Management: The holidays can be a particularly stressful time, so finding coping measures (other than reaching for food or alcohol) is a healthy way to hep ensure you don’t gain an ounce during this time of year. Keep the focus on family and friends rather than food. This article was originally written for the Health Ambassador program for Truvia. (1) Raaijmakers LC, Pouwels S, Berghuis KA, Nienhuijs SW. Technology-based interventions in the treatment of overweight and obesity: A systematic review. Appetite. 2015 Dec 1;95:138-51. doi: 10.1016/j.appet.2015.07.008. (2) Cadmus-Bertram LA, Marcus BH, Patterson RE, et al. Randomized Trial of a Fitbit-Based Physical Activity Intervention for Women. Am J Prev Med. 2015 Sep;49(3):414-8. doi: 10.1016/j.amepre.2015.01.020. (6) Yeomans MR. Alcohol, appetite and energy balance: is alcohol intake a risk factor for obesity? Physiol Behav. 2010 Apr 26;100(1):82-9. doi: 10.1016/j.physbeh.2010.01.012. (7) Schoeller DA.The effect of holiday weight gain on body weight. Physiol Behav. 2014 Jul;134:66-9. doi: 10.1016/j.physbeh.2014.03.018. (8) Steinberg DM, Bennett GG, Askew S, et al. Weighing Every Day Matters: Daily Weighing Improves Weight Loss and Adoption of Weight Control Behaviors. J Acad Nutr Diet. 2015 Apr;115(4):511-8. doi: 10.1016/j.jand.2014.12.011.